Anthea has been passed from home to home since her parents’ death. She wants only to be a proper young lady that a family would want, to become a Rose Maiden, and to receive the King’s blessing. She lives on the civilized side of the wall, protected from the plague and the savages who live on the other side. Horses spread the plague that decimated their ranks and the humans alike, but those filthy beasts were all gone long ago. That’s what Anthea knows – until she is abandoned and forced to leave her home once again. She’s given one last chance for a family and sent across the wall to the Last Farm because no one else wants her. A farm where she discovers they raise and train the forbidden horses. Where some control horses with the Way, a forbidden talent. A farm with family – her father’s family. Her family. A family that has always wanted her. This is the Last Farm, where Anthea finds a special connection not just to her family, but to horses – and one horse in particular. It’s a connection that could bring her a whole new future. But will her betrayal cost her, her family, and her beloved horses everything? I loved, loved, loved The Rose Legacy! I grew up on horseback, breathing and riding horses. The telepathic communication between people who have the Way in this book and the horses is just wonderfully communicated in simple language. There are times in our world that people bond with horses in ways that seem almost mystical, and I think Jessica Day George does an incredible and believable job of conveying that immense bond between man and a very, very intelligent and loving beast. 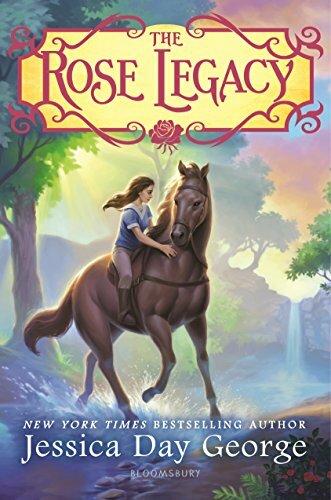 The Rose Legacy by Jessica Day George is an engrossing journey that will enrapture fantasy enthusiasts and horse lovers alike. The characters are believable, the world-building superb, and the storyline is fresh and original. I’m hoping there’s a sequel in the wings. I think anyone who loves fantasy and/or animals will be entralled by this book. Highly recommended for any age.